MINNEAPOLIS -- Former Minnesota governor Jesse Ventura is no stranger to shaking up the political world. Now, the one-time professional wrestler says he'd seriously consider being Donald Trump's 2016 running mate. "If Donald Trump were to ask me to be his running mate, I would give it very serious consideration because anything to break up the status quo of this country," Ventura told CBS affiliate WCCO. "This country needs to be shaken up. It needs to be shaken to its very core, and Donald Trump is doing that." The billionaire businessman is leading the polls in the Republican race for president. He was center stage at the first candidates debate, making headlines for being outspoken and controversial. "My advice to him at this point would be, 'Don't you dare back down, cause if you back down now, you're finished,'" Ventura said. "They tell you defense wins Super Bowls, but that's not presidential. Offense can win the presidency." Ventura thinks having his name on the ticket would help bring in votes. "We've been friends for about 25 years, so I don't know if it's in the cards or not, but it just went through my head, 'Boy would that ever get the Republicans angry,'" Ventura said. Ventura raised the idea when former Trump adviser Roger Stone appeared on his online show "Off the Grid" on Tuesday. Stone responded that Ventura, an Independent, would have to register as a Republican. 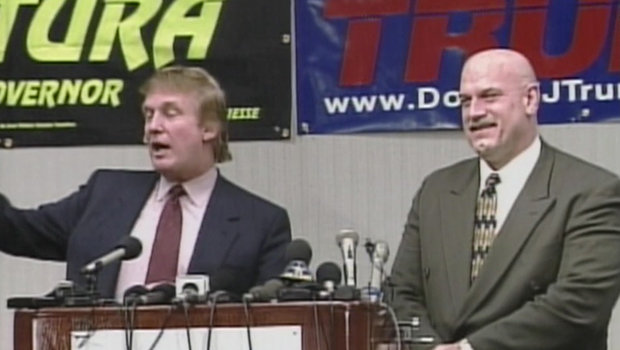 Trump made a stop in the Twin Cities in 2000, where he attended a fundraiser for Ventura. At that time, the governor announced his support for a Trump run at the White House. "He hasn't announced himself as a candidate for president yet, but I will say this: I certainly hope that he does," Ventura said on Jan. 7, 2000. Fifteen years later: "I see Donald Trump very much, and Bernie Sanders, too, campaigning like I did when I won the governorship of the state of Minnesota. Speaking from the heart, speaking with no notes and just telling people what you feel and the truth, and if you do that, you have a damn good chance to win." Ventura thinks what's attracting voters to Trump is that, like him, Trump is not a career politician and he speaks freely.